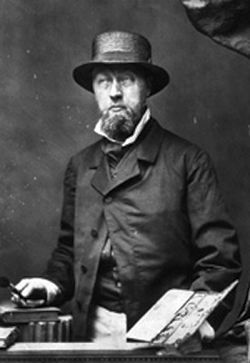 He influenced both Monet and Manet and was admired by Camille Pissarro, yet little is known of the influential Dutch painter and printmaker Johan Barthold Jongkind. He was born on June 3rd in 1819 in the small town of Lattrop, a small town in the Netherlands near the German border. 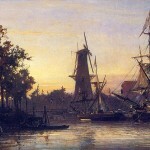 He spent much of his life in France and his painting technique reflects a strong Gallic influence but his outlook on nature was decidedly Dutch. Modern and period biographies tell little of his life before 1852. Much of what is known of Jongkind’s life comes from M. de. Fourcaud, an art critic who wrote about the painter upon the sale of one of the Jongkind’s pictures after his death. It is known that he studied under Sheffont and Eugene Isabey but I couldn’t find any other details of his early life. One source listed his debut in the Paris Salon in 1845. In 1849, he was studying under Eugéne Isabey in Paris. Most agree that he participated and was awarded a medal at the Salon in 1852 but there seems a bit of disagreement as to whether the medal was of the first class or of the third, though third seems more widely recognized. For most of his career, his works were denied a place at the Salons or received poor placement. It is believed he did exhibit at the Salons in 1848, 1850, 1852, 1853, 1855, 1864-1870 and 1872. Jongkind continually studied the sun’s rays and the play of reflections as the light traveled across the landscape during the day. Though his works were not a commercial success during his lifetime, his study of the atmosphere and light influenced a number of more well-known impressionist artists of his time including, Claude Monet, Edouard Manet, Tryon, Diaz and Rousseau. 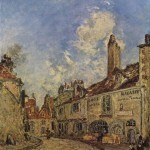 Monet referred to him as a man of profound genius. He traveled frequently between Holland and France. He painted nature as he saw it in the form of watercolor sketches and paint his paintings from those sketches. His paintings, all signed and dated, provide a virtual itinerary of his travels. 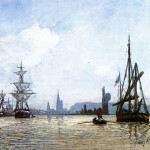 Based upon his paintings, it appears he was in Normandy in 1865 and in Holland in 1868. He is believed to have lived with friends during his later years and died on February 9, 1891. Johann Jongkind left behind a legacy of landscape and marine oil paintings, watercolors and etchings. Many believe the simple and clean lines of his etchings make his works in this medium among the foremost of Dutch artists. 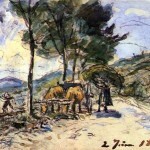 He is considered an early Impressionist painter with strong ties to classical works. Sadly, as shortly as 10 months after his death, his paintings became highly sought after with prices for his paintings and etchings ranging from 40 to 200 times more than prices the he could sell them for. He typically earned only 3,000 francs a year but just a year after his death his Maas at Rotterdam sold for 28,000 francs and Canal at Brussels for 17,000 francs.